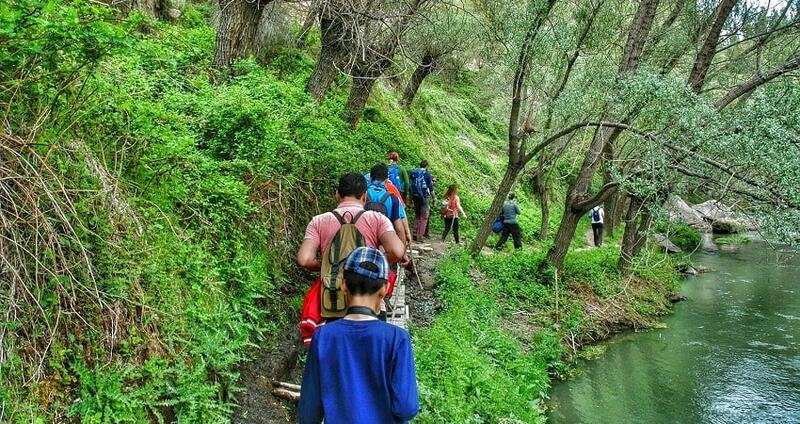 Explore the magnificent part of South Cappadocia by participating in Cappadocia Green Tour. 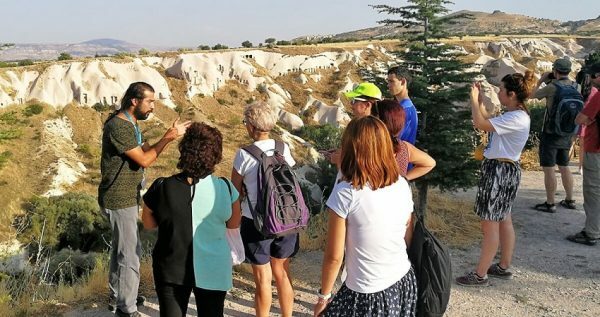 This full-day excursion includes some of the most important highlights of South Cappadocia region, such as the infamous unique rock formations, spots that offer panoramic views, a river walk, unique natural landscapes and of course important sightseeing locations. Ancient underground cities and craved rocks will impress you while touring around the region. Do not miss the chance and get to know Cappadocia’s history and culture, as this will be an amazing memory from your holidays. 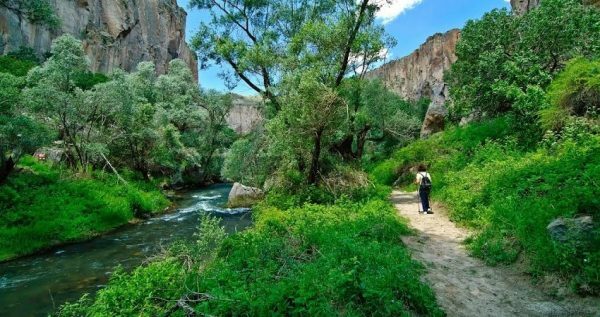 The exciting Cappadocia Green Tour starts during the morning. You will be picked up from you hotel by a modern, comfortable and fully air-conditioned bus. Our professional team members, the driver and the guide, will ensure that you are having a smooth and relaxing touring experience and they are ready to assist you in any case. The bus will drive you towards the first stop of your excursion, which is Göreme Panorama point. There, you can enjoy panoramic and breath-taking views of the Göreme city. The location is ideal for photo shooting as you will be able to observe the fairy chimneys and the outstanding surroundings. 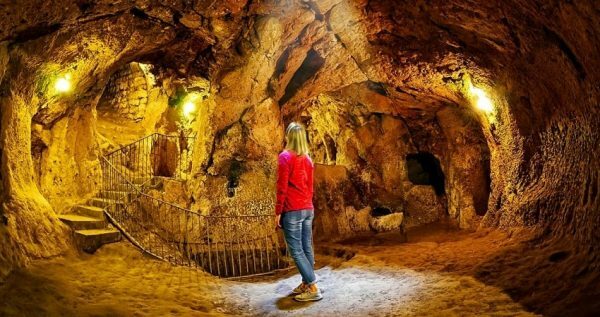 After the short photo break, the bus will continue towards Derinkuyu as your next stop is scheduled to be made at the famous underground city. In general, there are 36 underground cities in the region of Cappadocia as Christians were building them in an effort to escape from prosecutions. This particular underground city is the largest and most famous as thousands of people are visiting the sight every year. It has a total of 8 floors however, only four of them are accessible to public. During your time there you will get the chance to observe the city’s winery, kitchens and other rooms that are carved into the ground. The guide will provide detailed and interesting information about the city’s history and design. For those who claim to be nature lovers or those who enjoy an active lifestyle, the nest stop is the ideal one. Ihlara Valley is a green river canyon that has a total length of 14Km. The bus will drop you at a certain point where you will enjoy a walking session along the river. Accompanied by you guide you will see some interesting attractions such as the Ağaçaltı cave church that dates back in the 4th century. The church’s interior is also interesting as it hosting some paintings from the 10th century. Your quiet and relaxing walking session will stop once you reach a local river-side restaurant. A lunch break will take place there and you will have the chance to recharge your batteries with energy to continue your excursion. The lunch includes soup, salad, and a choice between, trout, chicken, vegetarian meal, or meatballs. Relaxed and refreshed you will then head back to the bus and continue your tour at the Selime Cave Monastery. The area has a cliff where characteristic rock formations exist. At the lower section of the cliff, you will get the chance to visit few fairy chimneys before going to the monastery. The tour guide will provide some interesting information about the place. It is estimated that the monastery was constructed between the 8th and 10th century and the halls included a missionary school, a church and a living area. Exactly opposite, on a cliff, there is another female monastery. The monastery is a great example of architectural design that is carved into rocks. High ceilings, balconies and large rooms will surely impress you. What follows is a short break at the Pigeon Valley. 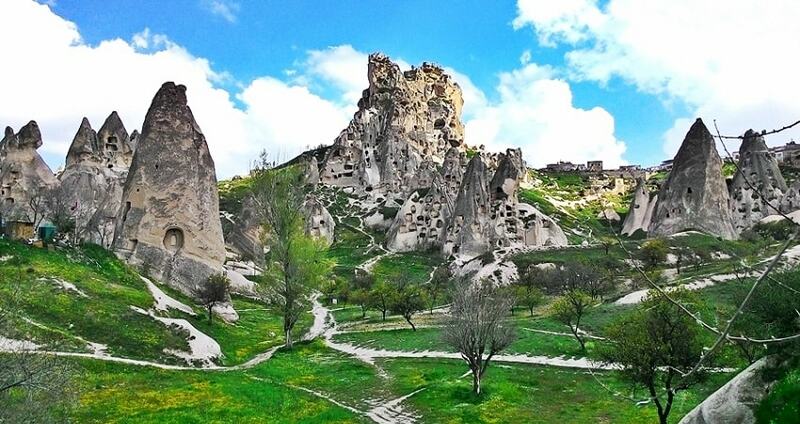 It is located at the skirts of Göreme city and forms an amazing photo point. The valley took its name from the ancient pigeon houses that were carved into the cliff throughout the centuries. From there, you can enjoy panoramic views and admire the surroundings. The last stop of Cappadocia Green Tour is scheduled to take place at a traditional Onyx Workshop. The prime material, onyx is a half precious stone and includes a variety of minerals inside. Following a step by step procedure the onyx master will carve one and explain to you the main steps of the process. After spending some time in the onyx factory, you will head back to the bus. The driver will continue on its way back as that was your excursion’s last stop. Cappadocia Green Tour is able to impress you and fill you with memories. This full-day excursion is what you need to explore Cappadocia, its main sightseeing points and understand its culture. 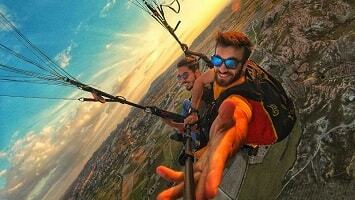 Cappadocia Red Tour is something not to be missed while you are in town. Participate in Cappadocia Green Tour and get to know the surroundings and main attraction points of the South Cappadocia region. Fairy chimneys, historical attractions and a river walk is what you should expect from this unique experience. This full-day exciting exploration fascinates every visitor due to the beautiful landscapes that includes. Create long lasting memories and understand Cappadocia’s history and culture with a unique excursion. Your holidays will be memorable as the region of South Cappadocia will impress you with its hidden secrets. Your full day excursion begins in the morning, when our team members will pick you up from your hotel. You will be driven towards your first stop with a modern, fully air-conditioned and comfortable bus, accompanied by your tour guide. The guide, as well as the driver, is responsible to ensure that you are having a smooth and relax excursion. In addition, the guide will explain everything you need to know regarding the points of interest and the places that you are going to visit. The first stop of your excursion is at the Göreme Panorama. 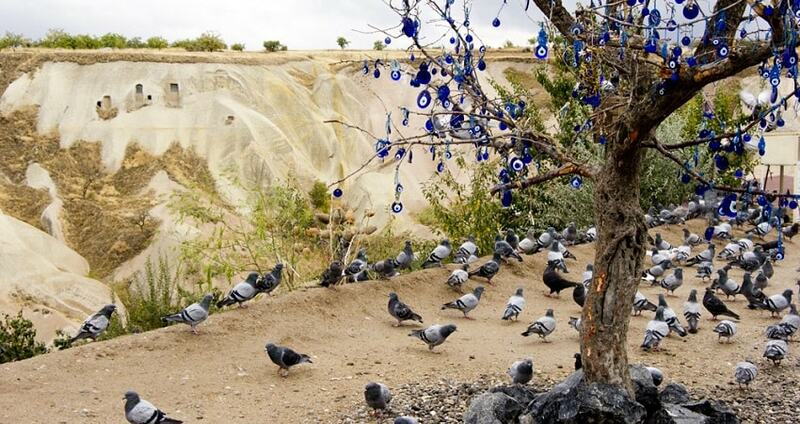 From there, you can enjoy magnificent panoramic views over the Göreme town. Therefore, make sure that you will snap some stunning photos of the area’s fairy chimneys. 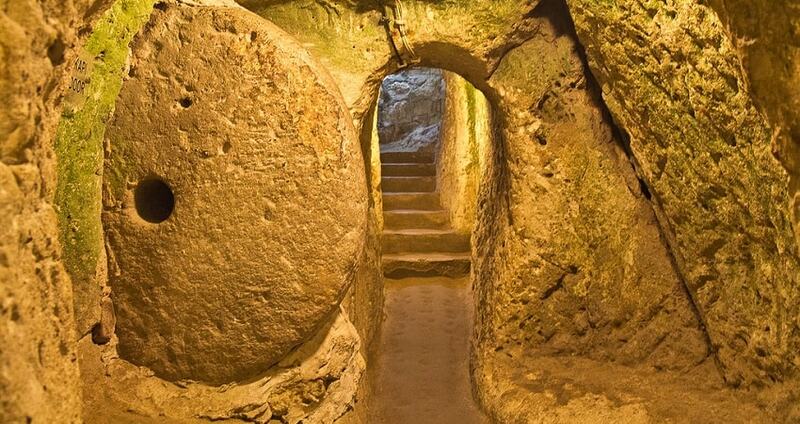 Derinkuyu is your next stop as you will be visiting the underground city. This particular city is the largest and most popular among the 36 underground cities that can be found in Cappadocia. They were built as an escape area that Christians were using in order to avoid prosecutions. The underground city will impress you with its size as it has eight floors that include, among other rooms, a winery and kitchens. It is important to mention that only four floors are accessible. Once you are there, the guide will let you know interesting facts about the underground city. After that, the excursion continues towards Ihlara Valley which is a 14Km green river canyon. The bus will leave you at a certain point and together with your guide you will enjoy a 3,5Km walking along the river. There, you will get the chance to observe Ağaçaltı cave church that was built in the 4th century and includes paintings from the 10th century. The walking session ends at a point where a river side restaurant is. 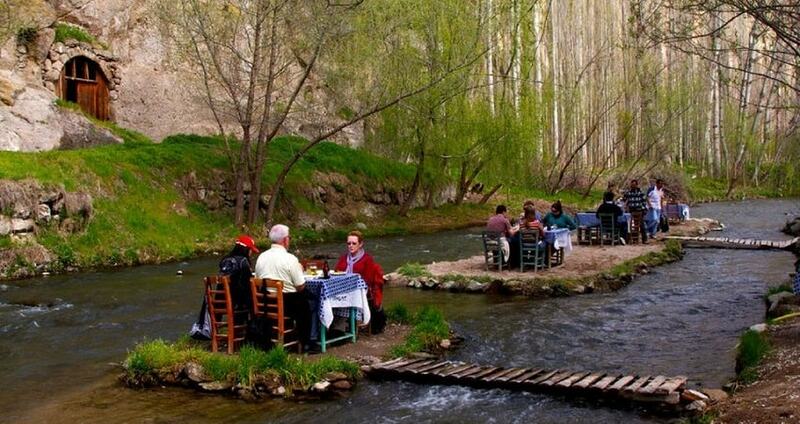 At a river side local restaurant you will enjoy a much needed lunch break. During your time there, you will have the chance to recharge your batteries with energy and relax before continuing your excursion. The lunch includes soup, salad, and a choice between, trout, chicken, vegetarian meal, or meatballs. 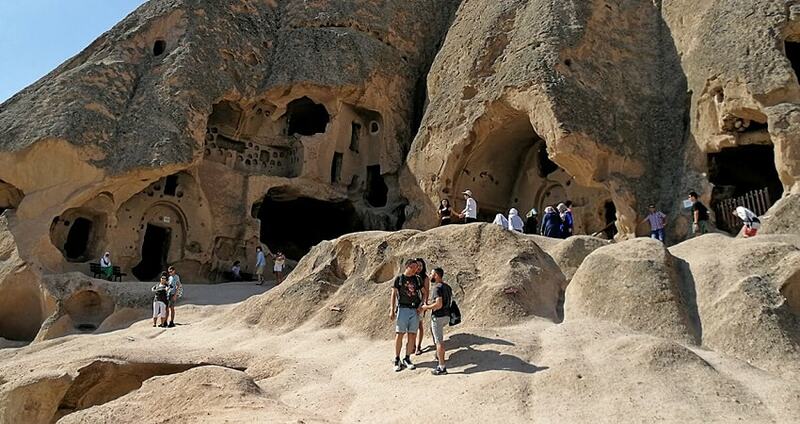 Right after your lunch, the Cappadocia Green Tour continues towards the next stop which is the Selime Cave Monastery. The area showcases some interesting rock formations and the monastery is built at a cliff. When you are at the lower section of the cliff you can visit fairy chimneys and took some photos. The monastery dates back in 8th and 10th centuries. It includes a church, a living area and a missionary school. The design is imposing as it has high ceilings and balconies carved into the rock. On the opposite cliff you can observe the twin female monastery. Once again, the guide will provide an interesting briefing regarding the monastery’s history and importance. A short photo-break follows at the Pigeon Valley, on the skirts of Göreme. Take a chance to admire nature and enjoy some panoramic views over the area. An interesting highlight is that the valley was named after the ancient pigeon houses that were carved into the cliff. The guide will provide an interesting description of the valley and will let you know everything you need to know about the area. Onyx jewel factory is the last stop of this exciting excursion. After that, the bus will continue on its way back. Cappadocia Green Tour finishes by the moment you arrive back at your hotel. By the end of your full-day excursion you will be amazed by the landscape and the attractions that Cappadocia region has. With great experiences, this tour will surely be a long lasting memory from your vacations.